Christmas is almost here…can you feel it?! If you take a few minutes and browse Pinterest, you’ll see countless Gift Guides for everyone on your list. I may or may not have been doing that the other night! I happened to notice that there wasn’t a lot of guides for bloggers…and being a blogger myself, I would have been drawn to that. There are so many courses and products that I would love to buy, or better yet – receive as a gift! So….here is my 2017 Gift Guide For Bloggers! I hope it will help you make that Christmas wish list this year or give a gift that your special blogger would love! Trello is a blogger’s best friend! Ok, that might be a stretch. But if you haven’t heard of Trello yet, you are missing out! It is how I stay organized with everything I have to do. You can set up boards for everything – business, home, recipes, to-do lists, editorial calendars, passwords…everything! Best of all, it is free! Hello, Trello! I think most bloggers have heard of ConvertKit. It is a well known and highly customizable email provider that is well loved in the blogging world. Plans start at only $29 and vary depending on the size of your email list. I use MailerLite for my email list and highly recommend it. It is free until you reach 1000 subscribers and then it is only $10 a month. It is simple to use and has so many features that a blogger needs, including landing pages. If you want more info before making that gift purchase, you can read why I use MailerLite here. If there was only one thing I could invest in for my blog, it would likely be Boardbooster. It helps me grow my Pinterest account on autopilot and I don’t have to worry about constantly being on Pinterest. My content is being pinned even while I sleep. Boardbooster is super affordable too and has a price point for every budget. First of all, Lena is a sweetheart! These strategies from Lena are amazing and very realistic for anyone to implement. She was able to grow her blog from 17k pageviews to 400k pageviews in 10 months. This is a must have if you are trying to grow your blog traffic. If you are trying to increase your income in a way that doesn’t involve sponsored posts or creating your own product, I highly recommend McKinzie’s course on Pinterest Affiliate Marketing. Many bloggers aren’t even aware you can pin affiliate links, but it is magical! My affiliate income has drastically increased from taking this course, and it didn’t take much work on my end at all. Affiliate marketing is pretty amazing once you know how to use it correctly! McKinzie has other great courses too, so be sure and check those out as well! This Ebook is called “The Ultimate Blogging Handbook” for a reason. This was the first purchase I made for my blog and I devoured it. If you want a great, comprehensive guide to blogging, this is what you need. You will find a bit of everything in here, from starting a blog to navigating social media to creating your own products. Facebook can be a tricky platform for bloggers to navigate. With Facebook algorithms constantly changing, it can be frustrating for bloggers who are trying build their business on Facebook. That is why I really appreciated this book. The author Brittany was able to increase her Facebook followers from 2k to 100k in five months! Her strategies are pretty genius, while also being simple enough for anyone to implement. If you are a blogger, you really need to be on Facebook and this book can help you do that with far less frustration. Can I just say that I love Instagram? It is my favorite platform for building my community. However, as much as I love it, I realize I need to use it in certain ways in order to effectively use it for my blog. Like Facebook, the algorithms often change and that can be a deterrent to many bloggers who are using Instagram as a way to build community and collaborate with brands. Inez is an Instagram rockstar! Her course has helped me build my account quickly and easily and has helped me earn more income using Instagram. You can USE CODE “SIMPLEHOME10” to get a DISCOUNT on her IG course AND any other course on her site. If you are a blogger and getting into video (which will be almost imperative in 2018! ), you will want this microphone. This microphone comes highly recommended by some of my top blogger friends in the industry. There are some cheaper microphones, but if you are looking for quality, this is the one you want! Have I mentioned Instagram is my favorite platform? In comes as no surprise that quality photos are part of the business. If you are looking for a camera that will consistently deliver quality photos, this is one I highly recommend! Get ready to rock it on Instagram with this camera! Thanks for sharing! I really do want to try checking out some of these things – like the courses and the books – to help continue growing my blog! I’m so glad you gave a camera suggestion. That is my next purchase as a blogger. Do you personally have this one? Is it easy to use? So many good gift ideas! I’ve never used Trello so I’ll have to check that out. And there are some others items catching my eye as well. All awesome ideas!!! We have a good microphone already thanks for my husband’s side hustle and I keep looking at that thing thinking I should do something with it but scares the bejeezus out of me. I can write all day but being recorded is not my thing, BUT I know I probably should. 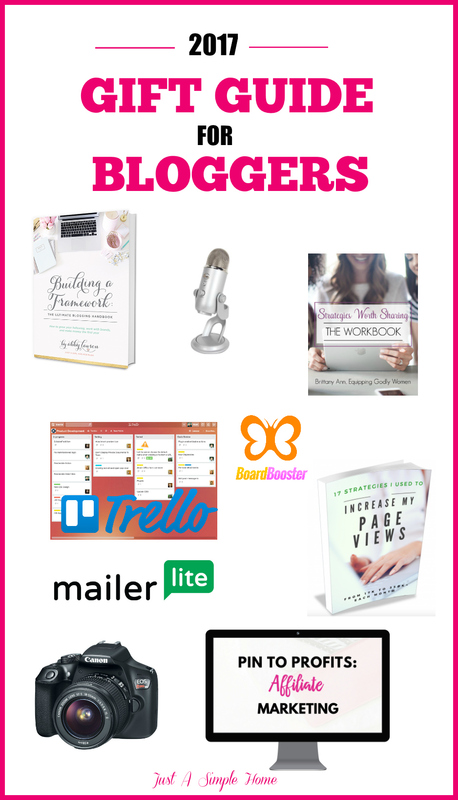 Hmmmmmmmm…..
Love this list and great gift ideas for bloggers. I was just thinking about upgrading my camera. I like Canon too! Thanks for sharing these ideas. These are great resources that I know I could benefit from, thanks for sharing! Great list! I loved Framework and don’t know what I would do without Boardbooster. Now I need to looking to that BLUE YETI MICROPHONE. So many great ideas here – I think I’ll share with my hubby. I haven’t heard of Trello either – so will check that out. These are amazing tips/gift ideas!! There were a couple I didn’t know about!! This list is seriously so good! Thank you for sharing! I am new to all of this so I will interested to try some of these things! This is a great list! I’ve been wanting to switch to ConvertKit for a while. I definitely wouldn’t mind someone gifting me with board booster. I also want a new camera, a few photo shoot sessions would be nice too. Great recommendations! Terryn, this is a great list! I’ve been wanting to start broadbooster since most of my traffic comes from PInterest. I finally need to get this started. I love the book recommendations too!